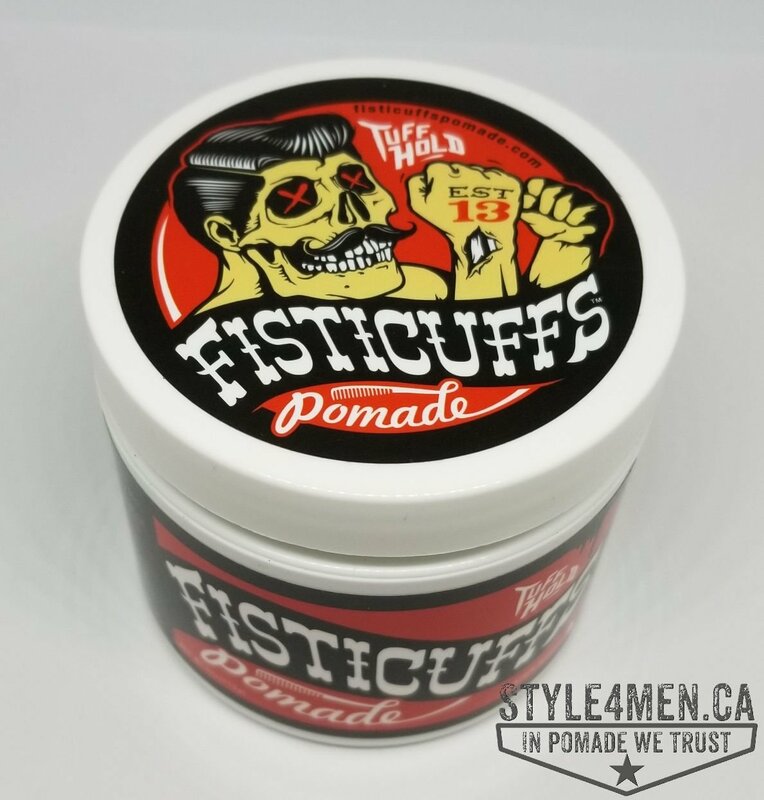 Fisticuffs is a pomade coming to from the US from the bunch that goes under the name “Grave Before Shave”. Under this moniker, they offer a wide range of beard oils and other beard care products. their labeling is particularly original and memorable. 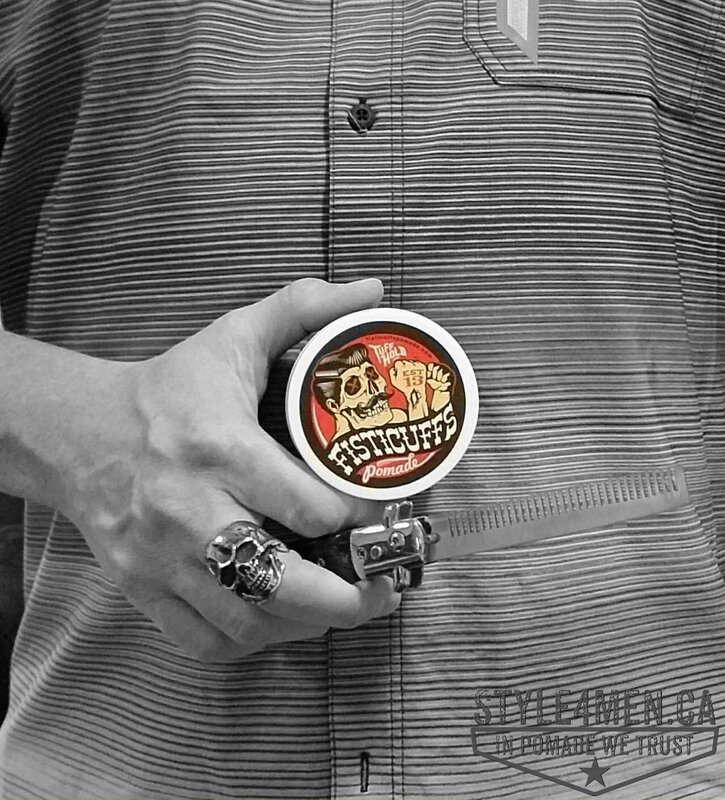 The Fisticuffs pomade labeling is pretty original as you can see. I first noticed this pomade a few years back, but it wasn’t until our recent trip to Montreal where I finally picked up a jar at the “Méchand Garçons” Barbershop on Mont-Royal. Pac kaging wise, this pomade comes in the 113 g white plastic jar that is the staple in the pomade industry. The very original labeling is unmistakable and sticks out with our semi-skeleton fighting dude. 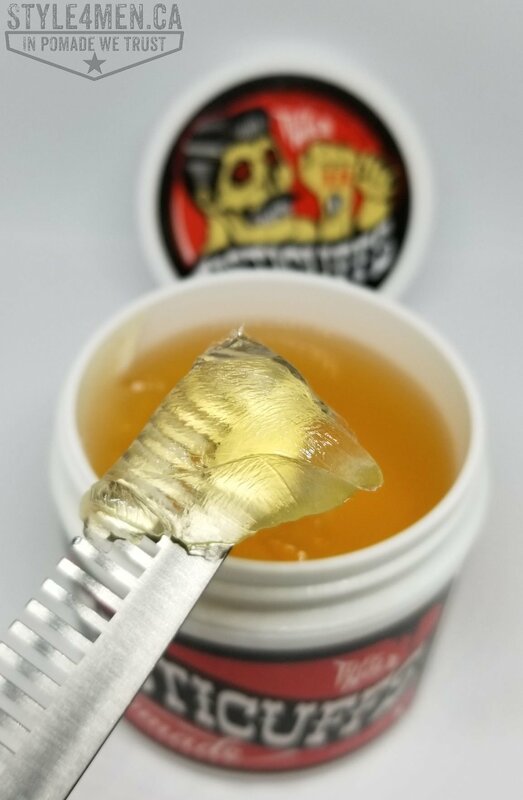 Upon opening the jar you will be greeted by a nice golden jelly pomade with a fragrance that is both discreet and manly. It isn’t strong enough to affect or collide with your after shave / cologne, but strong enough to be noticed. I will say that it is a classic men’s cologne scent that will make you feel right at home. I know, not a very clear cut description. When scooping out the pomade, I was pleased to find that firm texture that has typically given me great results. As always, the pomade has to be relaxed in the palms in order to be applied to the hair. As it turns out, the behavior of this pomade is a tad different than what I am accustomed too. First off the firm texture led me to think that it would be very similar in working with to lets say a Suavecito, or Seppo’s, or Imperial. Relaxing the pomade in the palm, the product became soft and appropriately sticky. Once in contact with the hair, it initially felt the same, but almost immediately I realizes that this pomade was different. In fact it reminded me a whole lot more of a grease based pomade at this point. It felt a bit heavy while remaining humid. The main perk of pomade is that it allows me to gain back control over my unruly and wavy hair. Pomade also lets me achieve a pomp, thus the love for pomades in general. 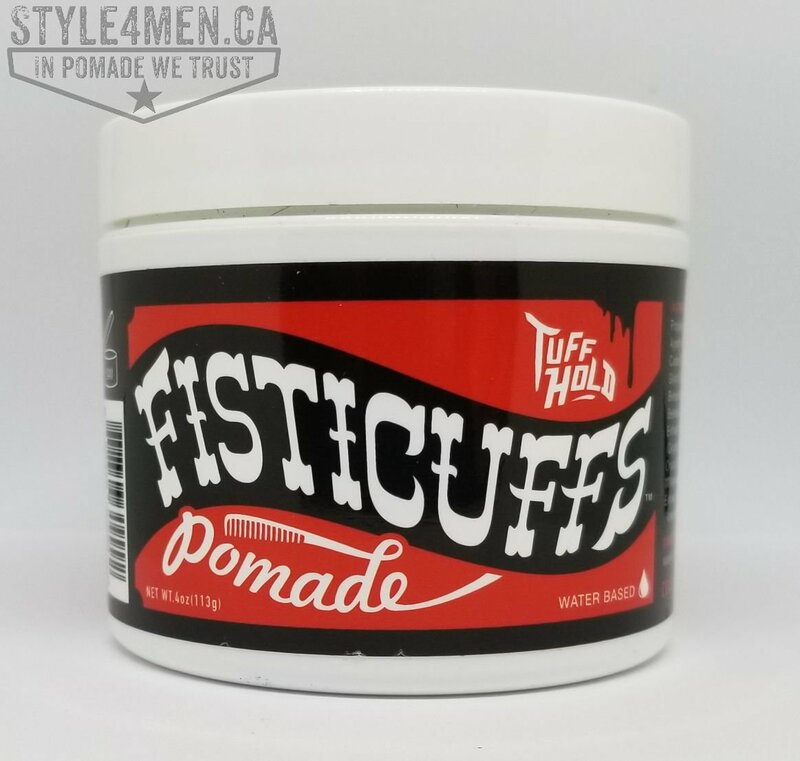 With Fisticuffs, the product remains active much longer than what I was used too for a water based pomade. My repeated use of pomades has shown me that styling my hair once it is dry renders considerably better and longer lasting results, than applying it to humid hair. By better I mean, great volume and height and by longer I mean, anything over 4 hours. 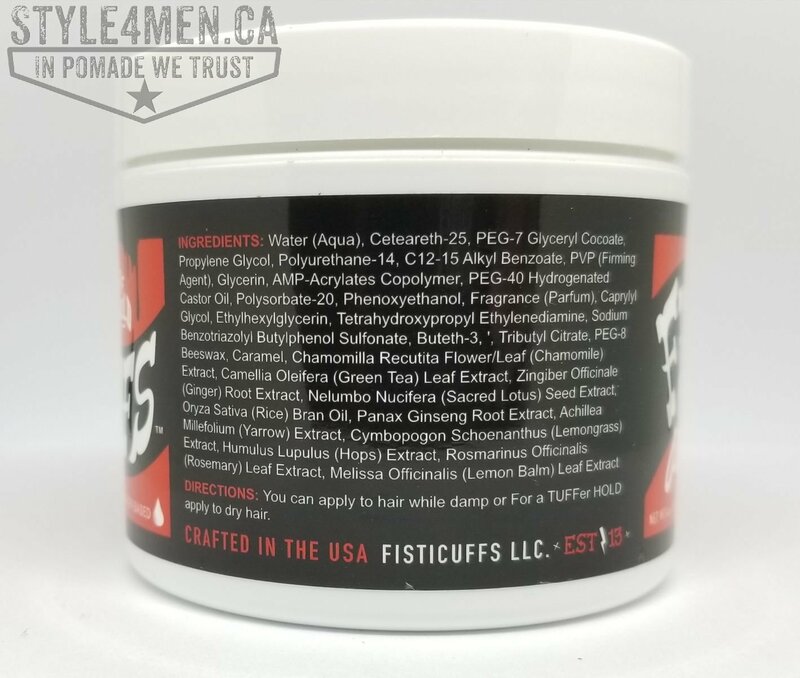 The Fisticuffs pomade was applied to dry hair, but because of the slightly higher oil and water content, the drying process is also longer. this resulted in my hair failing a little out of place during breakfast. The resulting look was pretty good nevertheless with the single strand of hair looping down on my forehead. Usually water based pomades dry within about 15-30 minutes. This one was more in the 60 minutes range. Once dry the product is firm, not crispy. It is a proper pomade after all and not a gel. The take away here is that for best results you should apply this pomade to dry hair and you might benefit from helping the drying process along with a hair dryer. In the shine department, it will please any shine seeker as the result is that of a classic pomade. I would venture something in the range of a 4/5. This is rather rare in the water based pomade space since shine is made possible by oils and grease used to make the pomade which a water based concoction has none of or very little. The ingredient list is somewhat long for a pomade. That being said, more than half of the ingredients listed here are various natural extracts which in our opinion warrant a few extra points as opposed to loosing points. I saw no parabens mentioned anywhere which grants Fisticuffs another round of bonus points. As mentioned on my Instagram post, this pomade was picked up at the “Méchants Garçons” barbershop in Montreal on Mont-Royal. At $25 it wasn’t cheap, but there were no extra shipping fees or duties or currency exchange. Plainly put pomades are suffering from their success. They are the cool thing to get and thus are generally being sold at a premium. Overall, this is turning out to be a very likable and interesting pomade but the “tuff hold” mention on the jar is perhaps not as tuff on thick and wavy hair like mine.